A Ribbon at the Minnesota State Fair! "Portrait of Lena" took second place in Fine Arts exhibit, textile category! 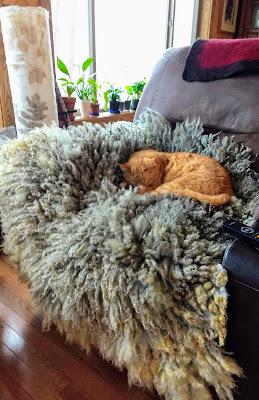 This wet felted piece has been very, very good to me. Just a quick update this morning, lots to do before the sun sets tonight. Merino tencel nuno felt yardage and the cute planter I got at the auction. Before the hail storm. The insurance adjuster has come and gone, we had damage to the roof of the house and the entire roof of the pole building. Now if we have to fix the pole barn roof, I'm thinking we should add at least one lean-to on it to house the sheep. Actually I'd love to add one on each side. I've always let the sheep access the barn via the slider, but I hate trying to keep that area clear so the slider is operational. Anyone have lean-to ideas or plans to share? I'm thinking if we add 8' on each side, we should put a door in the existing walls so it would be easy to feed the sheep without going outside. The good news about all the storms and rain this summer is our pond is almost FULL already! We took this photo last week, it's probably even a little higher now. Hopefully our hay guy will get his cattle in there soon to make use of all that forage. While we were there, I checked on my pumpkins, watermelon and cantaloupe plantings in the compost piles. They were like a jungle covering all three piles. I made the mistake of picking a watermelon. It was not ripe yet, but chickens and sheep loved it. My neighbor says not to pick watermelons until after the first frost. My mom says they're ripe when the little curly things near the stem dry up. Does anyone know? And would the same hold true for the cantaloupe? It was too hot this summer to mulch my salsa garden and my tomatoes look terrible. I grow Brandywines and they usually keep vining and producing well into the fall. But this year the plants have blight, it's been so wet. I'll have plenty make juice and salsa with though - if I get the time! I am so busy trying to get things ready for the Minnesota Lamb and Wool Producer's booth at the State Fair. I resisted dyed the scarf above last night. I'm bringing my stuff down tomorrow and will stick around to help set up the booth. Then I get to attend the "Sneak Preview" of the Fine Arts Exhibit. My wet-felted piece, "Portrait of Lena" was accepted into the show. I can't wait to see it hanging at the State Fair! I'll be working 5 days in the MLWP commercial booth at the fair (it's in the dairy building, near the haunted house); I'm just hoping I'll have the stamina to hold up for all 5 days. I think it will be a great learning experience even if I don't sell all that much stuff. This morning Stan & I are going to have eye exams and order new glasses. My poor glasses are totally bent out of shape. I take them off for close up jobs and there were so many times they fell in the hay and got stepped on. The most memorable was when the first lambs of 2009 were born and they fell into the hay. I was horrified to see Ozzie (the Aussie) take off with them, crunching all the way. It's time to get new ones and quit trying to reshape the old pair. Last Sunday morning this what we found. I heard the crackling of a tree coming down during the storm the night before. Our south perimeter fenceline is under there. One of the big oak trees that gives River Oaks its name, just split in two. It keeps sinking lower, threatening more of our perimeter fence. Here it is after Stan spent hours trimming it down, we've got a call in to a professional to finish the job. That's a thick trunk! The good news is we'll have lots of oak firewood to keep us warm next winter (not this winter). And this is what we found this morning, just days later, the north fence is under this. At least these are smaller trees. My corn was about 7-8' tall yesterday. It's been knocked down so many times this year, I wonder if it will come back again. Look at the cattle panel and tarp hoop house. We were planning to take it down anyway. We said goodbye to Shachah the other day. We love that dog! He has a calm, sweet temperament along with the ability to run off any dogs that came in our yard, and Lord knows what all else he kept away. He barked quite a bit at night, especially when there was a full moon. He is a super cool dog, so smart with a real sense of himself. Well, you might be asking, why did we give him away then? The answer is we only have 5 acres here and he needed more to guard. As it was, he guarded all three houses at the end of our cul-de-sac and he was damned good at it. The problem was that only two of the houses wanted to be guarded. LOL. He was fine over the winter just guarding the ewes in the pasture out back. But when spring came and the ground thawed, he became a Houdini that could get out of any place we put him - digging under and slipping through despite the barbed wire. And being a Great Pyrenees/Akbash cross, he had a mind of his own, did things on his own pace. We learned that it was best to just let him do his thing, because calling and chasing and trying to forcibly bring him home wasn't going to work. He never stayed away too long or went very far, or did any damage, but if he had a mission in mind, he was going to do it one way or another. He loved to sleep on his back. Eventually we just left our gates open at night so he could guard the whole place. Many a night I would go out with the flashlight to see what he was barking at, he liked having some back up. In the morning we'd look to see where he was. Usually we'd find him laying in front of our garage or out in the center of the cul-de-sac, guarding the whole end of the road. He was so cool. Shachah waiting his turn for a drink of fresh water. Ozzie the Aussie got to go first. None of the neighbors ever actually complained to us about him, but I just didn't feel right about having a large dog running loose at night and sometimes barking incessantly. So when Sabrina expressed an interest in getting another dog to replace her beloved Sally, I offered him to her. I had been thinking that hers would be a great home for him and it just seemed right. She came over the other day and he took to her right away, it was just amazing. She has such a way with animals. We put him in the back seat of her truck and he rode the whole 3 hour trip to his new home without a problem. I look forward to seeing and hearing how things go for him on Sabrina's blog. There's a big empty spot in our hearts without our "Big Dog"and I'm scared that whatever he was barking at is going to think it has free reign now, but in the long run I think we made the right choice for him and for us. If we ever move over to our 40 acres, I would get another LGD or two in a heartbeat. But hopefully Sabrina won't have to chase any more bears out of her yard with him around. I've been on a felting bender for over a week now. Yesterday I finished two hats that were inspired by Suzanne Higgs' beautiful work and the hats I saw at the Midwest Felting Symposium. I think they will be warm in the winter with all those layers. This hat is made from black Shetland and a romney wool/angora rabbit blend batting. I was unhappy with all the long hairs on it while fulling, but now that it's dry, I love the soft matt surface provided by the angora fiber. This one is the Black Shetland liner with a dyed Romney wool and silk cap embellishments. I also made some felt covered buttons and the nuno/laminated scarf on the mannequin. I finally finished this black Shetland hat about 5 days earlier than the ones above. It seemed that the fedora style was the only kind of hat I could make, so I forced myself to try something different. Everything looks good on that head. I look terrible in hats myself. Sorry for the lack of a decent background, I'm just too busy creating to clean up my work space. I will do a proper photo shoot of all the things I've been making at some point in the future.